Personalised black waist apron with three front pockets great for those in catering, hosting or salons. Personalised black waist apron with three front pockets great for those in catering, hosting or salons. Have your name, initials, nickname or company name embroidered in your choice of colour and font style across the top left hip. Makes a unqiue and useful gift or stylish workwear for yourself and employees. Personalised black waist apron with three front pockets great for those in catering, hosting or salons. Have your name, initials, nickname or company name embroidered in your choice of colour and font style across the top left hip. Makes a unqiue and useful gift or stylish workwear for yourself and employees. This waist apron is made from 65% polyester for easy care and 35% cotton for durability and comfort. Fully pre-shrunk fabric fade resistant and machine washable. 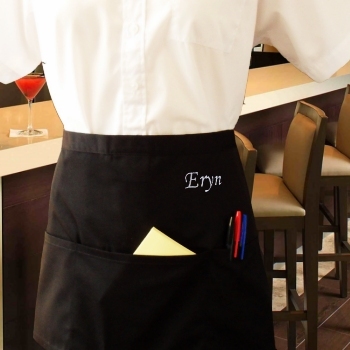 This bar apron is wrap round style with generous black nylon waist ties. 3 Pockets Bar Apron.